REI can provide comprehensive real estate services to our clients, across the globe, including Europe, China and sub-Saharan Africa. 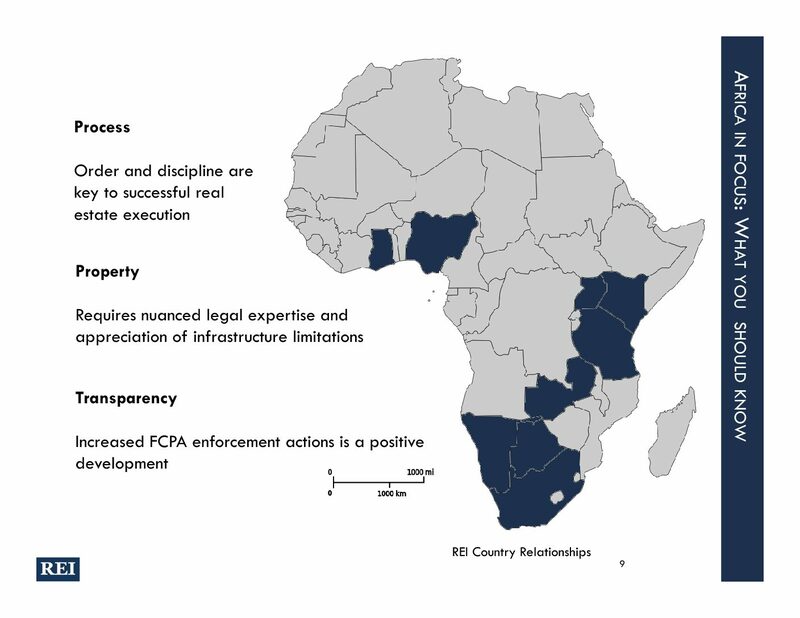 In fact, REI places special emphasis on advising US clients active in sub Saharan Africa – REI has established a substantial network to service African markets. The most common mistake made by American advisors is assuming that real estate risk in Africa will manifest in familiar and expected forms. Our detailed process brings order and discipline to real estate execution. We have a particular focus on nuanced legal expertise and an appreciation of infrastructure limitations and opportunities. § REI has provided strategic real estate insight to a Fortune 500 US based multi-national in order to help them refine and expand an extensive product distribution network. § REI has advised an Africa based property owner client on a complex land deal in Uganda that involved foreign buyer entities and disputed land rights. § REI has offered key client services on risk discovery, risk mitigation and deal execution for a prominent retail real estate developer in Nigeria.